there, at the main entrance of the World Bank was this large inscription" Our Dream is a World Free of Poverty. "He couldn't go wrong, he thought.Today, he often thinks the sentence should have been completed:" And we make sure it will just remain a dream. "In this riveting economic thriller, Paul Jordon, a renegade World Banker,and Moni Cheng, an Andean woman who leads a socio-environmentalnongovernmental organization in the Peruvian Amazon, endurekidnappings, bombings, and deadly chases in their fight against boundlesscapitalism, destructive economic policies, and corporate greed that arewreaking worldwide social injustice and destroying the globe's richestzones of biodiversity.Together, Jordon and Cheng expose corporate ruthlessness, militarybrutality, and Machiavellian economic policies of the foremost financialivory towers of Washington, the World Bank, and the InternationalMonetary Fund. With other visionaries from around the globe, Jordon andCheng untiringly disseminate truth and candid information about thecalamities caused by this cruel machinery. 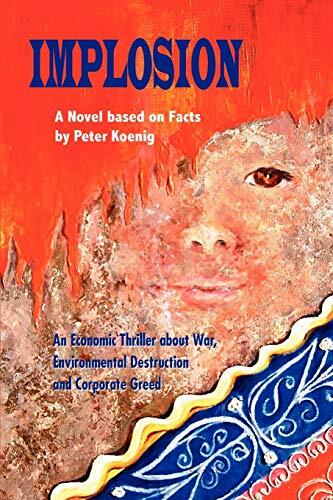 And against all odds, theymobilize the power of the people.Richly detailed, grounded in actual events and statistics, and complete withnotes from author and former World Bank economist Peter Koenig,Implosion is both an unsettling, gripping novel and a powerful commentaryon the realities of the modern world's corporatocracy. Peter Koenig has worked most of his career for theWorld Bank as an economist and water resourcesspecialist. He has traveled extensively throughoutthe world and drawn ideas for many of the scenesin Implosion from his personal experiences. He andhis wife live in Europe and South America. Theirtwo daughters and son live in Geneva and Denver.Email Peter at implosion.pk@rcn.com.